Recently I was contacted to try out a new audiobook subscription service - eStories. Is this company a viable competitor to Audible? I think so. Like other subscription book services, you pay a monthly fee to receive credits that are then used to purchase books. Their basic plan starts at $11.99 for 1 credit per month (it's a little cheaper if you pay the fee annually instead of monthly) and you have 6 months to use the credit. They have an app for Android and iPhone, plus you have the option to listen in browser. Interestingly, instead of popping up a separate window the player runs along the bottom of their page and you can continue browsing their site without interrupting the player. As for the selection: it's great. I saw a lot of classics like Orwell's 1984 and Hinton's The Outsiders, but there were also brand new releases such as I Liked My Life by Abby Fabiaschi. There was an overwhelming number of choices. I had a hard time choosing but decided to go with a cozy mystery since it is difficult to find cozy mysteries at my digital library. 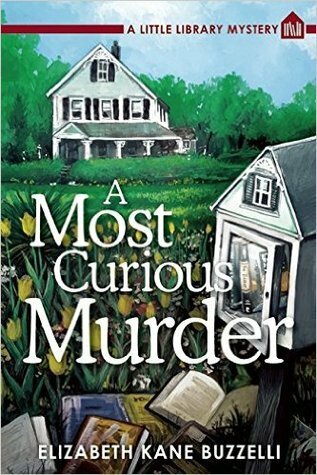 I got A Most Curious Murder (A Little Library Mystery #1) by Elizabeth Kane Buzzelli and I look forward to listening to it. It was easy to navigate the site and "purchase" the audiobook. The app seems pretty straight forward. I like that when I clicked on "view book details" was I not only offered suggested reads but that there was a link to "more by narrator". I don't see this option very often, but I do occasionally love a narrator so much that I want to hear more books by them. I downloaded the book on my computer so that I would be sure to have it forever. The MP3 tracks come in a zip file and can be listened to using any media player that uses MP3 files. Overall, it was an easy site to use with a large selection of audiobooks that ranged from the classics to new releases. There were titles I readily recognized as well as ones I'd never heard of (I'm going to look for a paperback copy of How to Read Literature Like a Professor by Thomas Foster). If you are looking for an audiobook subscription service, I recommend eStories. But don't take my word for it: Sign up for a 30-day FREE trial today and see for yourself. Get even more book news in your inbox by signing up for our newsletter: http://eepurl.com/mHTVL. Girl Who Reads is an eStories and Amazon advertising affiliate; a small commission is earned when purchases are made at eStories or Amazon using the links on this site. Thank you for supporting Girl Who Reads. I love audiobooks on the go and for listening while I'm working or doing crafts around the house. I have never heard of eStories. I clicked over, and the selection is really good. Thanks! I was impressed with their selection, too.